The return of Coitus comes in the form of a celebration of the world’s most beautiful boy – Francisco Lachowski. Photographed alongside a selection of our favourite boys from around the world by an array of photographers in true Coitus style. David Valensi, Devon Spence, Kim Kraglund, Louis Mayhew, Will M, River Hawkins, Samuel Tingman, Billy Morgan, Tiago Pinheiro, Joao Moreno, Rodrigo Braga, Max Silberman and Scott Gardner. 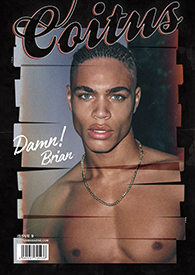 Coitus – Issue 02 – Bite Me!